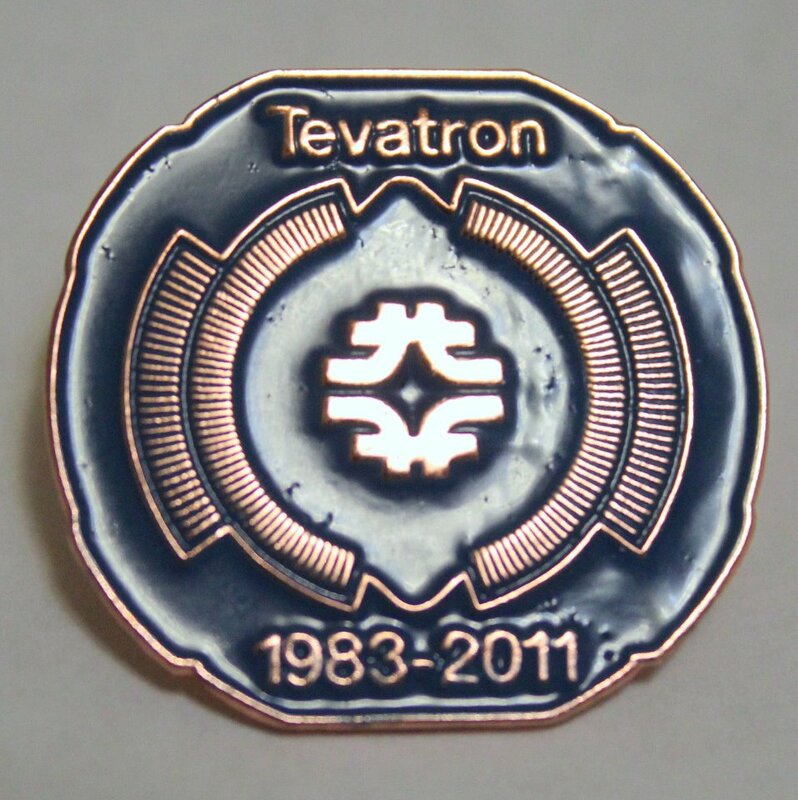 They say that all good things must end and it is certainly true for the Tevatron. The US hadron collider based at Fermilab will finally shutdown in just two days time. The last moments when the switch is thrown to kick the store of protons and anti-protons into the graphite dump blocks will be webcast live from the control rooms at 2 p.m. CDT on the 30th of September. There will be celebrations but they are likely to be somewhat muted. The operators would have liked to continue for the chance of finding the Higgs boson before their European rivals at CERN but congress refused the funding. The Tevatron’s greatest discovery was the Top quark which it found in 1995. In 2002 the new higher luminosity run II began. Between then and the final day the two detectors CDF and D0 will have recorded about 10.7/fb worth of collision events. Run II has had many smaller successes including the exclusion of the Higgs boson over a range of masses but it has missed out on the opportunity to take the prize for its discovery. That glory will now almost certainly go to the LHC. When Run II began the LHC had just been approved and was expected to start running in 2005. Project delays and funding reviews pushed that back to 2007. Then further delays due to accidents that damaged the magnets meant that the final startup date was the end of 2009 with the first serious data being recorded in 2010. It is tempting to wonder if things would have been different if it had been expected earlier that the LHC would start operating so late. The recent decision to end the Tevatron was I think the right one. It had become clear that the LHC results would overshadow anything that it could now produce. Fermilab has remained optimistic that their final total will help find the Higgs. If you add the Tevatron data to the LHC Higgs plots it makes a difference at the low mass end where we now think the Higgs is hiding. In this plot the black line is the unofficial combination for the latest LHC data while the red line shows a fuller combination with CDF and D0 included too. But that is not the whole story. While the LHC is starting to see bumps that might be the first hints of where the Higgs could lie, the Tevatron just sees a broad and statistically weak excess. The difference may be that the detectors at the LHC have much better energy resolution. They are next generation gadgets in a world where technology is moving very fast. At low mass the Higgs resonance is narrow and they will need good energy resolution to see it well. I am not sufficiently well versed in the lore of detectors to know if the Tevatron could have beaten the LHC to the Higgs discovery if they had put more into the collider before the start of Run II. I know that some opportunities to upgrade the detectors were passed over. Perhaps that would have been sufficient to see the signal the Higgs produces. With the benefit of hindsight we can see that things might have been done differently if they had known of the delays that would befall the LHC. The race between the LHC and the Tevatron has been a classic hare against tortoise story and as in the original Greek drama the hare took its time to get going. Two years ago when the LHC was just starting up, the Tevatron had already excluded the Higgs at 170 GeV. If it had been sitting at that mass there is little doubt that the tortoise would have claimed the prize. In this real life version of tale however, the distance to go was a little longer and now the hare is coming through to take the finish line. This will certainly not be the end of the story for the accelerator complex at Fermilab. 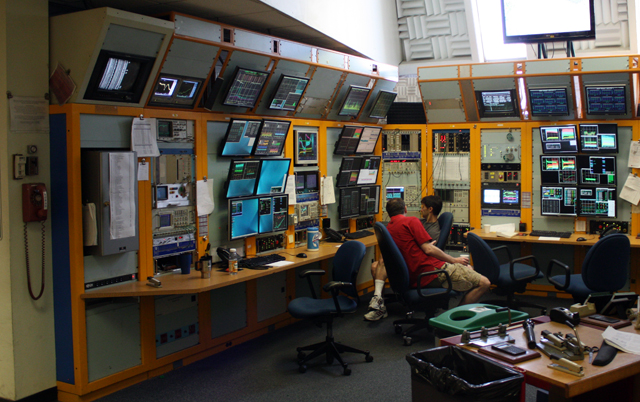 Stopping the Tevatron gives a chance for neutrino experiments to take over the injectors. Two new neutrino experiments will be added to help in a field of research where there are many mysteries to be resolved. Another line of development known as project X will explore the intensity frontier with muon beams and perhaps eventually an ambitious muon collider will be funded. The future for collider physics in the US now depends on the choices that the government has to take. This entry was posted on Wednesday, September 28th, 2011 at 7:11 pm and is filed under Tevatron. You can follow any responses to this entry through the RSS 2.0 feed. Both comments and pings are currently closed. You say that the LHC detectors have “much better energy resolution” than the Tevatron, presumably meaning it can pick out a Higgs more easily. But I have read in one of these blogs (the usual suspects I guess) that the energy range below 130 GeV is where the LHC detectors find it more difficult to pick out a signal. So which is it? Good question but the two things you are saying are not really contradictory. The region below 130 GeV is the hardest for the LHC to explore, but it is just a question of statistics. ATLAS and CMS will look for Higgs decaying to two photons in this region. These events are very rare so a lot of data is needed to see them. When they do happen the detectors are very good at catching the photons and measuring their energy and momentum. The width of the peak they are looking for would be just a couple of GeV so it is important for them to have a resolution at least as good, otherwise the signal spread out over a wider range and there is more background to separate it from. This is something the are good at. With 10 to 15/fb at the end of next year they will know. CDF and D0 are not so fine at finding the diphoton events and they are much rarer at the tevatron because of the lower energy. On the other hand the Tevatron has an advantage in being able to see events where the Higgs decays into bottom quarks. This is a more common event but a more messy one to see. The bottom quarks quickly decay into jets that have to be distinguished from all the other quark and gluon jets. There are also associated neutrinos that have to be seen via missing energy. At the LHC the higher energy and higher pile-up make these events harder to separate from the background. 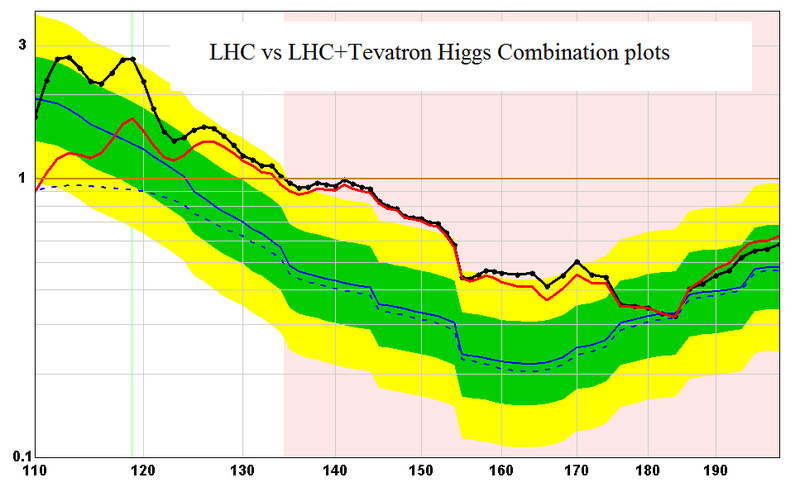 The Tevatron has fared much better but their combined bb plot shows no sign of a Higgs signal below 130 GeV (see plot at bottom of this page http://tevnphwg.fnal.gov/results/SM_Higgs_Summer_11/ ) It may be that they have been unlucky with the stats, or that the resolution and background separation has not been as good as they think. It could also be that the Higgs is not in that region. They would really need to at least double the amount of data they have to start to rule it out (unless they have some dramatic plan to improve the analysis). I truly enjoy your blog. Your graph today is still quite similar to your September 18, 2001 graph (viXra diphoton Higgs combination ATLAS+CMS) which was much more pronounced with three peaks in the area from 110 to 140 Gev.. Just by reading that graph, it is too messy for a signal from a single type of particle. With three peaks, they could be a “Fine Structure” of something. What do you think? From that diphoton graph alone you cannot say much because all variations are well within the sigma bands. These bumps are just reflecting where the relatively few events that have been seen so far have fallen. It would be completely wrong to conclude much from that plot alone. However some of those bumps are repeated in other decay modes and the combined plots are getting close to hinting at a signal. The 140 GeV bump is the most convincing statistically so far while the region around 120 GeV is on track for a signal but much more data is needed there. We need the next update which will have about 5/fb per experiment before we can start talking seriously. When they have nothing better to do else, they could use these 2 remaining days to run the maximal luminousity and check one time more the area 119 – 126. To analyse these data they can continue still after the switch-off.